The Entrance test for VIth Class admissions into navodaya Vidyalaya for summer streams is held on yesterday. Recently admit cards for entrance test are issued in all Common Service Centers. Around 6 lak students have appeared for admission test in VIth std for 2018-2019 Academic year. Government aided 524 schools will start their new academic year on June first week. So admissions process will start regularly on December itself. Entrance exam for Selection of candidates will be in second week. of February. Answer key is released after one week. Exam is conducted on an OMR sheet. Sot valuation of answer sheets will take atleast 2 Months time. Official date for Declaration of Selection list, Results will be on First week of May itself. Intimation for call letters and admission letter download starts next day. Currently 550+ schools have held their Admission test recently. Students belonging to summer bound JNV academic year must wait till May first week. JNV Selection list 2018 is published in the official website itself once the details are reported to HO. Each District has its Own School in the name of Jawahar Navodaya Vidyalaya. Check the complete district wise lists and their website links. The below states are following Summer Academic year. The winter and extreme winter bound JNV schools results are declared in Early June or July. The JNVST Phase II sixth class examinations was to be held on 15 July 2018. Application registration and the admit card download was already being commenced. Applicants are pleased to know that exam results and Final Navodaya Selection list 2018 will be released after 15th July. Submit comments below if you need much more updates. Hi Students Recently Navodaya has updated the website from nvshq.org to navodaya.gov.in. Final selection list for Chandigarh state, Madhya Pradesh state was released in the official website. Visit the below link to download the Final students roll number wise results. 80 students are selected in each District wise Navodaya Vidyalaya school. 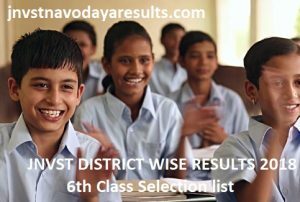 Check Navodaya Pune Region VIth Class Selection list. Jnv Buldhana district in Maharashtra. Class 6th Result when declare on website. Please confirm as soon as early. 6th class results of Mysore district of Karnataka state are not yet declared... students are eagerly waiting. Is there any technical problem or what? Special, thanks for update to me. i did not found gomati district (tripura) class vi result . we are waiting karnataka chickkaballapura result. when we can get the same. Srikakulam not in andhrapardesh ? what about srikakkulam result srikakulam not in andhrapradesh ? Thanks for the information about Navodaya Exam Results 2018. Thanks to admin for giving a results of JNVST Through district wise. Nice information of JNVST State and district wise results. I am happy to see this many number of students are getting free education by selection trought JNV Navodaya 6th Class Entrance exam 2018. Nice information of JNVST Results 2018 thorughout India. Nice Website about JNVST Results 2018. Thanks to let us know about the Exam results are soon declared sir. Nice Information sir. Please help me with admission process and JNV Result card checking with my hall ticket number. Very knowledgeable information about JNVST Results 2018 as state and dist wise throughout india. Thanks to admin. A very good initiative brought up by Indian government for Free CBSE School education wth JNV Selection test 2018. Please provide the admission process in Navodaya schools. Good Information of JNVST Dist wise results. It is very helpful to candidates who attempt exam of JNVST Navodaya in 2018. thanks to admin. Good Information about JNVST Results 2018 as a section wise of all dists. By reading this i got more information about JNVST Results 2018 as dist wise. Once again thanks to admin. 33.can u plz suggest me when can be results are relesed for Up Kheri disctrict ..
36..gayatri from khammam district telangana state where can i find the Official website link for jnvst navodaya results .can u plz post the link ? 37.Harish from rajastan state i want the jnvst navodaya results of Sawai Madhopur district. 39.im from Bhoopalpally i belong to Telangana state when can i get results of jnvst navodaya class 6th can u plz post me..
Will Hyderabad and Andhra Pardesh result come at a some time or the result will be declare in different time in different state? am from Hyderabad Telangana actually i want to know when the result is going to be out of 6th standard can you please ping or post on your home page? Am from AP i just want to know or if i get a link of selection list or please post a selection list on your home page. If i want to withdraw my application what should i do for this. Because am relocation in Hyderabad. Did AP and Telangana marks wise list are same or it will get a new one for the Telangana? In Telangana state very less student get pass and i am one of them. May i know that’s the reason behind this because my friend also get fail by some margin and he said he have written well. So is there any option for the Recorrection? When i was writing the exam by mistake that OMR paper get tear. So its there any issue its valid or invalid? When i was asked with the invigilator she said nothing will happen. Dose she said right? Am Raju and am from Hyderabad may i know when the result are going to be result? can you please share the link of it? May I know the excite date when the result are going to be issue of May first week? When the new academy year will start and when the school is going to start of first June? and can i know the date of selection list of Hyderabad? Will winter exam result will be on July or it will be change? if its in July then what will be the next procedure after the result and same goes to extreme winter? As you have mention the word category what does it mean by that word? Is this sign of Cast? or what? i’m trying to open my district for selection of district wise school .but it is not opening .so please provide the link. if i’m having two schools of vacancy apart from my district ,can i select that one also.